From Southeast Asia's busiest metropolises with delirious nightlife to the peak of volcanoes, many of which are still very evidently active, which the fertile slopes are dotted with glimmering rice fields and small villages. Java (Indonesian: Jawa) is the heartland of Indonesia. With more than 130 million people inhabiting an area as big as Greece, Java is one of the most populated places on this planet. No wonder that Java has become Indonesia's political and economic epicentre throughout the history. Java is Indonesia's fifth-largest island. Its 130 million people make up 65% of Indonesia's entire population, and makes Java the most populated island in the world. Covering an area of 127,569 sq. km (7% of Indonesia's area) and with a population density of 940 people/sq. km, Java is the world's most crowded major island as well. 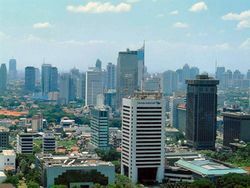 Jakarta, the capital of Indonesia, is located on northwest region of Java. Surabaya (the second largest city in Indonesia), is located on East Java. Java acts as Indonesia's center of cultural and economic activity. Java has 121 active volcanoes. Add to that a host of major national parks and, despite its very crowded nature, the island has lots to offer the visitor who appreciates outdoor attractions. The main ethnic group in Java is Javanese, except for the West Java region where most people are Sundanese. In the province of East Java, 22% of the population is of Madurese descent. Half of them live on the island of Madura. Jakarta is the capital of Indonesia. Population: 8 million (within city limits). The total population of Jakarta and its suburbs: 12 million people. The population of Jakarta is a mix of many ethnic groups. The group native to Jakarta is Betawi. The massive urban sprawl of Jakarta, Bandung in the hills and national parks. Charming Yogyakarta and very important temples. Indonesia's second city Surabaya and stunning volcanic scenery. While Indonesian (Bahasa Indonesia) is the lingua franca understood by almost everyone, the majority of Java's population speak Javanese as their first language. It is the largest unofficial language in the world with 90 million native speakers. When travelling in Central and East Java particularly, you will hear this language spoken very often. You'll even hear the local pronunciation change — the most notable change is a turning into o, so eg. Surabaya becomes Suroboyo. But although widely spoken, Javanese is rarely written in public sign. Other significant local languages include Sundanese, spoken in West Java, Betawi in Jakarta and Madurese, spoken on and around the island of Madura and some parts of East Java. Most visitors arrive at Jakarta, Bandung, Semarang, Surabaya, Solo and Yogyakarta. There are several domestic airlines such as Garuda, Merpati, Lion Air, Mandala, Sriwijaya Air. International airlines: AirAsia, Singapore, Qantas, MAS, Cathay Pacific, KLM, PAL, Thai International, JAL, KAL, Eva Air, Air India, etc. Bakauheni (Lampung/Southern Sumatra) from/to Merak (Banten). Rp 12,000 for a 2-3 hour journey. Java's infrastructure is by far the best in Indonesia, and it's possible to cross the entire island by land in a single (long) day. However, the sheer density of population means that roads can get overcrowded if you're moving at the same time as everyone else. The main form of long-distance transport, vast armadas of buses cross the island and connect every city and mountain hamlet. Watch out though, as many drivers have near-suicidal driving habits that emphasize speed above all else. The Eksekutif Bus is comfortable enough, provided with AC, reclining seats, and toilet in some Eksekutif Bus. Some big cities have several terminals. The point to point travel uses various minibuses with 6 to 11 passengers. Some cities have many points, you should go from one point, but can stop before the arrival point, so please check the points and the routes. You can book about 2 weeks in advance by telephone without any payment first. It is faster than bus, but bus is more comfortable for the long legs. Java has the best railway network in Indonesia, with trains connecting the capital city of Jakarta with most other cities and towns in the island. The eksekutif class is the best class, and consequently the most expensive. Ticket reservations can be made starting 90 days in advance. On-line ticket reservation is available on PT Kereta Api's ticketing site . You can pay in the website or just get booking code and pay at thousands of Indomaret and Alfamart stores around Indonesia without any additional fee. You can also make reservation and pay directly without booking at the stores. The system is similar with plane ticket reservation, so different date or time and when you're booking will give different (but slight different) price tickets, moreover you can choose your seat when reservation. Java's toll roads are built nearly to Western standards, with dual grade-separated lanes in both directions and elevated interchanges. Tolls are quite affordable, usually Rp 1,000-5,000 every 10 km or so. However, signage is often lacking and driving habits are atrocious, so it's very wise to pay a little extra and get a car with driver instead of attempting to drive yourself. Low cost carriers make some destinations inexpensive. Please check the price and compare to bus, travel and train ticket prices and also the time consume. Airplanes ticket for peak season (Lebaran, Christmas and Holiday) ussually is double than low season price, but ticket price for bus, travel and train is relatively stable (only low increase in peak season). Java offers everything a somewhat adventurous traveler is looking for: two of world's great ancient monuments, volcanoes (all 121 of them), major national parks, rainforests, tea and rice plantations, large cities, big waves and even savanna. The scenery in most parts of Java is spectacular and, while the island is overpopulated, there are still plenty of unspoiled places. Even though the beaches are not very appealing in Java and tides can be fatal especially in south part of Java, in nearby archipelagos like Pulau Seribu or Karimunjawa the traveler can find white sand beaches and corals islands. Trek in Ujung Kulon National Park and Mount Halimun Salak National Park, see excellent examples of rainforest and wild animals. Dive in the pristine waters of the Karimunjawa islands. Rent a fisherman's boat and sail around the Kepulauan Seribu National Park archipelago. See the crater of a volcano real close at Tagkuban Perahu (in Bandung). Watch the sunrise at the breathtaking Bromo-Tengger-Semeru National Park. Surf one of the world's great waves at G-Land near Banyuwangi. Travel from Jakarta to Yogyakarta by day train. Beautiful landscapes and a cheap and more relaxing way to travel around Java. Visit the Dutch war cemeteries Menteng Pulo (central Jakarta) or Ancol (in the north of Jakarta by the sea). They are haunting and quiet getaways from the bustling city. To visit Ancol, take a taxi and ask for "makam kehormatan Ancol". Visit Kebun Raya (botanical gardens) in Bogor. Wake up early to see the sunrise at the Borobudur temple near Yogyakarta. Watch a spell-binding evening performance of The Ramayana against the lit backdrop of magnificent Prambanan. Climb the Gunung Gede volcano. Play golf at the Merapi Golf Course in Yogyakarta. 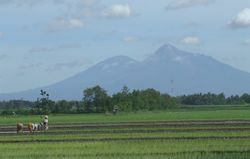 The active volcano Mount Merapi looms over the course just a few miles away. Eat mie goreng from a street vendor ("kaki lima"). Try martabak. Eat ice-cream at Toko Oen in Malang. Visit the hot springs and waterfalls in Baturaden, close to Purwokerto. Visit the huge shopping malls at Jakarta. Enjoy a fine Sunday brunch in any Jakarta international hotel at an amazing value. Boiled water or water from a sealed bottle. Coffee or tea. It's safe. The same applies to Bir Bintang, which combines very well with a hot indonesian dish. Use common sense, as you would do in your own country. Most common is (fortunately) theft, violent crime is rare in Indonesia. However, it's wise to be extra cautious in Jakarta and other big cities (See also wikitravel: Jakarta section). Avoid crowds. Traffic can be chaotic. Watch out for trucks, cars, motorbikes and other moving objects. One rule applies: "might is right". Don't expect traffic to respect pedestrian ("Zebra") crossings (even when a police(wo)man is in sight). When crossing a busy street - be confident, make sure your intentions are clear to the oncoming drivers. Cars never stop, but if they know what they can expect from you, they will avoid you. Using hand signal like put one hand in the air or signaling stop might help, too. Never recommend to drive a car or ride a motorbike without somebody else beside you. Wisely, get a driver with you when traveling in Java and other islands in Indonesia! This page was last edited on 6 February 2019, at 06:41.